Canoeing and Kayaking is one of the ultimately exciting family friendly things to do, whatever the age of your kids we have experience of getting you paddling as a family. What better way of getting your children to become inspired by nature, with the advantage that when paddling an open boat with children they can participate, you travel together and best of all the journey can go on when the kids get tired without the complaint of the dreaded words of carry me, or my legs, arms feet ( insert normal whines) are tired! One great thing is that the little nippers can even have a sleep as you carry on downstream, that if they have finished eating the contents of your snack box or cool bag, Kids seem to eat a lot out on the river- be warned. Its well worth having a lesson or two before you introduce the younger members of the family to the sport, so that you feel happy moving the boat about and wont crash into the nearest bank of stinging nettles with a boat full of Nippers and that you are comfortable in the boat. We often instruct in open boats so we can lift out young paddlers to give you the chance to practice some skills, learn to paddle and stop the boat wobbling too much. We like the little paddlers to get involved paddling kit suitable for little people, these include kayaks with special skegs to help with paddling in a straight line as well as little paddlers for our youngest paddlers which are great for splashing mum or dad as well as buoyancy aids suitable for all ages, swimmers and non swimmers. Most of our paddling is on flat water with rivers that have shallow sections suitable for helping paddlers develop skills. 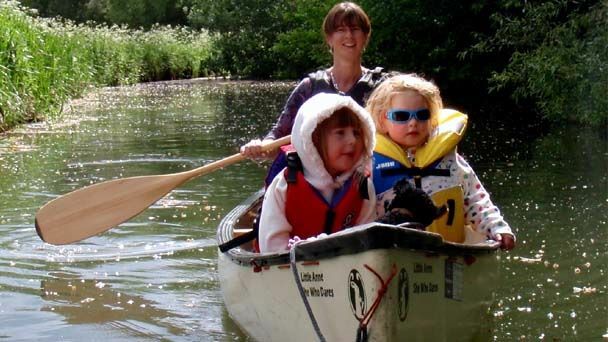 We arrange there and back sessions so that you can turn back when you think your family have had some fun or have a picnic on route, (ice cream stops, pubs and cafes are available on the river near to each lock paddling upstream or downstream from the centre if you do need to bribe the kids into a longer paddle! Downstream we have great ice cream sops at the Old Mill Stream and the Crown public house near Broxbourne,both are a short paddle from the centre. In addition the centre is based in the heart of the Lea Valley park which offers some beautiful picnic spots on route. Just remember to include in your drybag some hand wipes if taking a picnic. The more confident you become the greater the distance you may want to paddle. We offer half day and day trips as you progress in the sport, we offer regular trips tours and trails and have years of experience of getting the kids out on the water. Its worth bringing some snacks, a dry bag for food and also some antiseptic wipes as young paddlers have a tendency to put hands in water regularly, then munch on sandwiches, snack, biscuits etc... not a good combination for later in the day! groups. Riverside camping is available at Rushbanks camp site which allow campfires as well as rope swings for the more adventurous paddlers/swimmers in the group!